Hmmm I thought I posted before, maybe I didn't hit the reply button after writing, YIKES. Popeye, I can't reveal my plans yet. But the awning material will be here Tuesday. C'mon Terry. It's almost Tuesday so you can give us a small insight. A teaser would be great. Good Morning, Gordon, Eleanor and I are really just "up in the air" LOL on what we want to do. The options are endless!! we have talked about putting a slide in the TH and raising the roof in the bedroom area I do have a front fiberglass cap I could use. We have talked about keeping the Tot'r and building a bigger motor, (to satisfy me) and getting a trailer to pull behind, big thing there is the actual Tot'r (living area) is not big enough. And of course the biggy is building/buying the class 8 truck/MH. In the mean time I will be upgrading/finishing all the little projects in both vehicles. 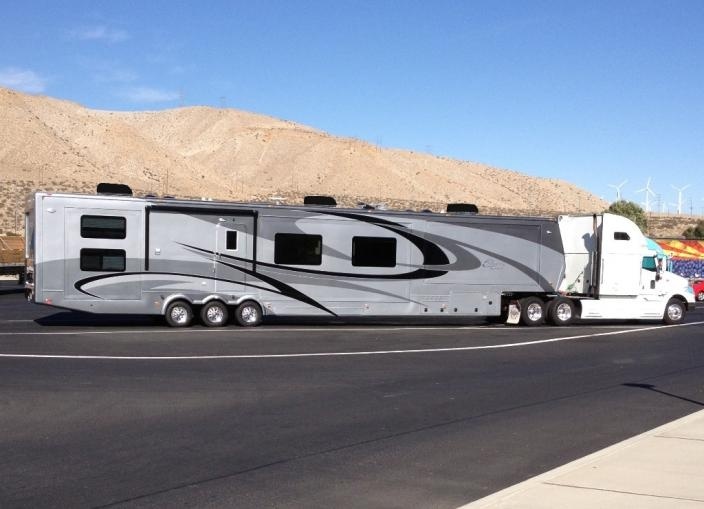 Glenn, now that's a RV!! Looks like a converted race car hauler with the triple single rear axles. It cold be a toy hauler with tail gate lift in the rear. Can understand the conundrum. So many options and not enough time. Yes bigger power would be nice but if you do I would think you would be obligated to do more travelling. Now that is a great thought. Place for the three of you here whenever you are going through. Class 8 would be wonderful but that could be a big time commitment. Possible to spend a lot of time building when you could be camping. How long would it take to build an 8 and a trailer? How long until Eleanor retires and you could be travelling? No wrong answer to this question in my opinion. Whatever you decide will be the right answer. Whatever you decide. If I get the chance I would be honored to assist you. However days are the issue. There is a possibility there will be a change in the residency laws so who knows? Looking forward to whatever you decide to do. Terry, you already said this, but if once Elenore retires you plan on traveling much more, slides, headroom etc will be of much higher value. Deb's and my old toy hauler was tiring on long stays. The living space was small, all those little things add up. We are so much more at home in Ms Prissy. You have time, build what you need, you will not regret it. Besides, your 3rd build will be even better!!! 2014 Tiffin Phaeton 40 QBH "Roughing It Smoothly"
Originally Posted by Lloyd in S.C.
What Lloyd said. And we will be able to rubber neck for another project! Good Morning, busy morning so far, getting ready for some storms later and picked up the next "DONOR" yup I just can't help myself, . this one is mostly just for the frame, it's an older model that has a frame that's very heavy built, 30 ft. long so it's going to be the next enclosed car hauler. New axles and hitch, Yeeehaw more projects, Lloyd, you've read our minds, The TH as I built it is perfect, a weekend to few week stay is great, and that is what I wanted it for, our plans have evolved to wanting to travel/snowbird ect, maybe fulltime. So the hunt is on, . I am one of many who enjoy and learn so much from your talented work. I am looking forward to this also. When you say the donor has a strong frame, do you mean just the base (floor), or the walls also? I would guess that the end product will be taller than the donor in the photo. 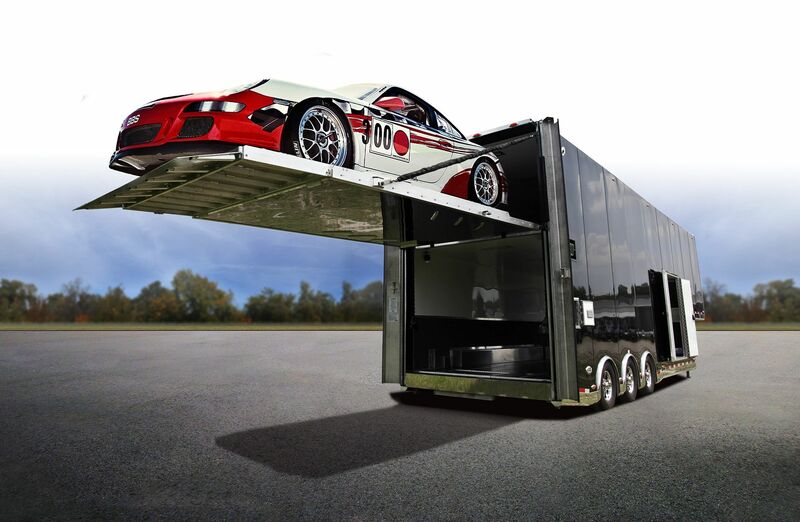 Or, maybe it does not need to be taller if it is a car hauler? Good to see the "boss/inspector" is on the job and in the photo. "The Eagle" - 1991 American Eagle 38J - Cummins 6CTA8.3 300hp DP, Allison MT643 4spd. Trans., Spartan chassis.